What started as a service offering to a few customers has turned into an entirely different branch for our company. We have set up our packaging operation to be extremely flexible so that parts provided by the customer and parts we provide or manufacture are all assembled neatly into the finished kits to our customers’ specifications. The range of packages produced by our dedicated staff can be as small as two parts to as large as master kits requiring several small packages with different parts combined into one ready to ship hardware package. With some kits requiring over 20 different parts, quality is bound to be an issue. 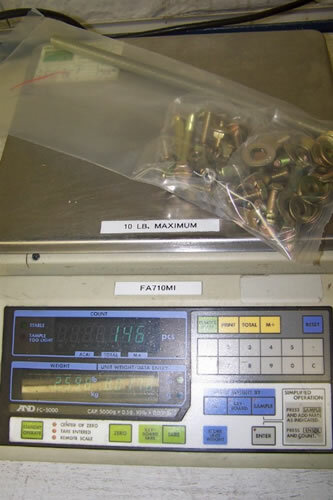 A part of our quality is a tightly controlled requirement to 100% weigh check to .001 pound. This allows the slightest variations to be caught and corrected. Feel free to contact us to discuss other quality procedures or what our capabilities can do for you.